I’m actually a very heavy sleeper. Once when I was a kid a drunk driver came down the hill and crashed into my sisters car parked on the street outside my bedroom window. I didn’t know about it until the next day when I found some cool colored plastic in the driveway. I showed it to my mom and that’s when she told me what had happened. We just beat Lego Star Wars II, so this strip was especially timely. And after all, who cares about work if you’re going to be in carbonite for who knows how long…? If only I could use that as an excuse to get some time off from work…haha. pretty sure i wouldn’t want to be encased in carbonite though. i don’t even like footy pajamas or too tightly tucked-in sheets. hehe well I’m quite a light sleeper and usually wake up when anyone opens the door to my room >.>.And sometimes it actually takes me ages to fall asleep so I’ve had my share of insomnia ^^ Man I’d like one of those cases :P.
I snorted tomato soup when I read this one! My girlfriend kept me up all last night wanting to watch all three of the original (and in my opinion, only, but that’s not here nor there) Star Wars movies last night. Being frozen in that stuff, if it actually existed I mean, would be horrific. But in a way it would probably be peaceful, just you in the darkness. I wonder what would happen if biff has to go though? Coloastmy (spell) carbonite bag for the stinky business? It would be ironic if biff had a Jabba the hutt alarm clock with the bass laugh included hehe. Well I just finished catching up on Biff and not suprisingly you now have a new fan. I don’t think I have ever seen a more amusing comic. so far I think 98% of your comics are funny (acutal figure I think 3 are not funny). It’s realy amazing that artwork which realy only stands out by the odd eybrows and is only a single pannal deal is so dang funny. shmixty nine thums up! I can honestly sleep thru anything except my alarm or telephone ringing, I used to live 100 yards away from the tornado siren when I used to work over nights, They set it off every wednesday at 1:00PM. It actually got stuck on once, and since it was louder than my alarm clock I slept thru my alarm clock till my boss called and I was 2 hours late for work with the siren still going off. Cybr Spce 95: I’m sleeping now. This means that I won’t hear your instant messages and a DVD is probably playing overtop of my away message anyways, so you have NO CHANCE of waking me up. Hell, you could come over to my house and push me out of my bed and I won’t wake up. I’m a heavy sleeper. …referring to the comment below the comic. I don’t freeze myself in carbonite. If Jabba doesn’t want Biff to be late for work, he shouldn’t have encased him in carbonite should he? Wait… does Biff even have a job? I always thought of him as an invevtor/astronaut/hobbyist. Before seeing the comment, I thought he was trying to sleep on the inside of his bed again… Except it was a waterbed. Oh man, do I wanna do that. It’s official… starting at about 2:00pm until 10:22pm. All the strips & all the comments read in 1 day. The unambiguous conclusion can only be…I’m filthy, stinkin’ RICH!How else do I explain that much time spent here without interruption? Unless… perhaps I’m truly addicted to the funny that is truly Biff? Thanks for so many smiles, Sir. Only the most foolish of fools would neglect to bookmark this site! …& WHY does he care about a BLANKET???!? He can’t feel cold, or blankets, or anything else – HE’S ENCASED! I COULD GO ON-&-ON, but the giggles are too much for me… I must go, now. You know this strip actually forced me to look up Insomnia. Hey DMC_RUN thanks for all the comments. Welcome Rikapuppy. Thanks for (finally) posting. Not me. I AM a Insomniac, so I’ve known what it ment for years. Not much fun. HELLO! HE PUTS DIRT ON THE ROADS! THAT IS A VERY VERY IMPORTNANT JOB! …else, how else will we splash the hitchhikers on the side of the road when we drive by? I’m both a heavy and a light sleeper. It depends on what is happening. I am a heavy sleeper through things, but a light sleeper when there are alive things. … … For example, I once woke up because I heard a cat’s footsteps that I didn’t recognize as either of my own cats. I looked right at the cat and remembered that I was at my dad’s house for the weekend and said hello to the cat and went back to sleep. Before falling asleep I remember seeing one confused cat just standing there in the doorway. Now, on that other side of the spectrum, I’ve slept through construction work, televisions coming on at near-full volume, alarm clocks, sirens, falling out of bed, falling out of a bunk bed, etc., etc. Yet I could hear someone talking outside and next door and wake right up. I must have some ninja in my family or something. I actually had a car crash into my room once, when I was 12. My mom thought the TV exploded. I didn’t wake up. FIRST HAN SOLO AND NOW BIFF?! I actually have very bad insomnia. I can’t sleep in a room with anyone else, because if they roll over in a bed less than 10 feet from me I will hear the sheets on the mattress moving and wake up. I’ve even woken myself up by doing that before. 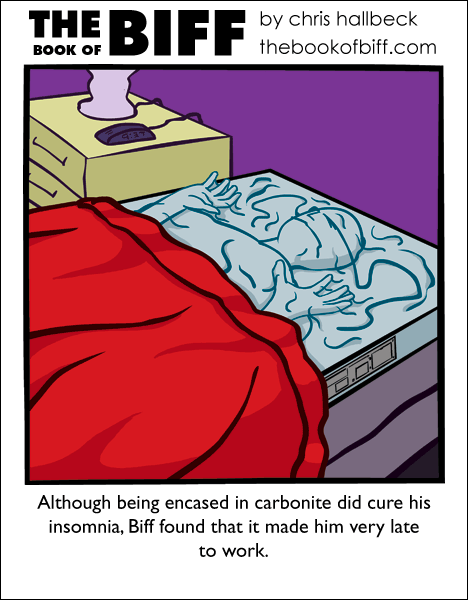 Carbonite sounds great, how about a year’s worth of sleep? I like how his eyebrows have been flattened against his head. I should do that next time i fly somewhere. I am a heavy sleeper unless I’m going to wake up, my parents wake me up or my alarm wakes me up. Otherwise, I could sleep through or fall asleep anywhere. I’ve fallen asleep and stayed asleep on a very rocky and cold mountain called Pico in the Azores. I have also fallen asleep almost every time I’m in a car and I can also sleep on a plane. Heck, I once slept through a plane going through heavy turbulance…. Haha, I’ve slept through really loud things before. I live in England, not far from Hemel Hamptsead, and a fuel silo or something there exploded a while ago. That woke my whole family up, but the first I heard of it was on the news the next morning. Also, not long ago, there was a REALLY serious storm right above where I live. The thunder was very loud, apparantly, and one thunderclap was particularaly loud. Somebody’s car window shattered, and loads of car alarms went off. Again, the first I heard of this was the next morning. where did he get carbonite? The alarm clock would have to be a sledgehammer. You forget, that was years ago… he’s definitely come up on the Road Dirt Supply chain of command. I hadn’t seen the original trilogy for a long time when I first saw this. Now that I have recently, this comic is much more funny. Once upon a time, lighting hit the house. I slept through it. But when my mother opened my bedroom door, to see if anything had exploded or caught fire in my room, I immediately snapped awake. I asked what was going on, she said lightning hit the house, I said “oh”, looked around my room, and went back to sleep. YES!!!! There are Star Wars nerds on the internet!!!! Once he finally gets out of that carbonite state, I wonder how long his eyebrows will be stuck in that frazzled position. I’m thinking weeks.